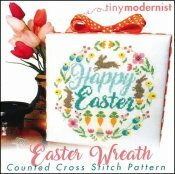 Easter Wreath [G1628] - $6.00 : Yarn Tree, Your wholesale source for cross stitch supplies. Cross stitch pattern from Tiny Modernist. Buds in bloom & brown bunnies too, we are "hopping" into Easter, how about you?!?! Creating this "Easter Wreath" is "Happy Easter" stitched in hues of green, brown bunnies with white cotton tails, yummy carrots & fresh spring flowers. Hippity hoppity Easter on it's way! Stitch count is 92H x 91W.